Dr. Uliana Gabara led a group of eight faculty members on a three-week in-country trip to the German Democratic Republic, Hungary, and Czechoslovakia. The trip was preceded by several weeks of personal research and on-campus presentations. 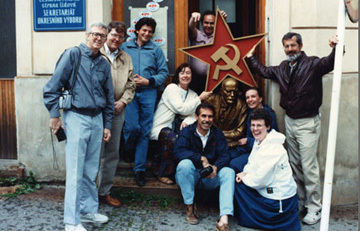 While in the GDR, Hungary, and Czechoslovakia, participants met with academics, intellectuals, and professionals. They also visited some of the region's most important cultural and political sites including the Danube Bend in Hungary, castles in and outside of Prague, and Potsdam in East Berlin.